Considering what passes for “country music” in Nashville these days (not to mention “country radio”) it’s easy to forget there are true heirs to the old masters writing, recording and performing in the here and now of 2011. Robert Ellis is one such artist. I caught the Houston musician at a club here in L.A. a few months back and have not shut up about the guy since. With a new LP, Photographs, on the shelves as of last month, I asked Ellis to discuss one of his heroes—George Jones. While on the road last week, the guys and me popped into a local record store in Denton, TX to buy some vinyl. Much to my surprise the store had a very extensive country music section, all in very good condition and appropriately priced. Trying not to spend too much, I left with around 5 albums. 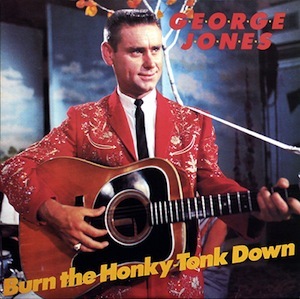 The gem of my finds is definitely Burn the Honky Tonk Down by George Jones. It’s a collection of tunes from 10 different recording sessions from 1965-1971 with Pappy Daily’s then newly formed label Musicor. I know most of the songs and have even covered a couple but this is the first time I have seen this particular collection. The cover photo and layout are what initially struck me. As usual Jones has an immaculate flat top and badass suit on. That strange little smirk and the layout of the text are just killer. This time period for Jones is also my absolute favorite musically because to me it is the perfect combination of the best songs, best musicians and the best production of his stuff. The arrangements sound huge in one way, yet very tasteful in another. It’s when songs were still mixed and recorded appropriately. Vocals are way on top and everything else is tucked under just so. There seems to be this need now to have every little part of a record be so loud and clear, drawing attention to itself. However, listening to records from this time period, the vocals are what stand out. Every other aspect of these arrangements serves the song. It puts George’s golden voice atop a pedestal of instrumentals whose foundation is interestingly beautiful, while never distracting from the vocals. Love the Jones. Just checked out the Robert Ellis record. Sounds legit. George Jones was the greatest country singer that ever lived (still is !) and i have lots of his albums , superb stuff. I also love the modern Americana and i’m looking forward to Robert’s album , due in the UK in a month or two, heard great things about it. Hope to see you over here in Scotland soon Robert……………..
I’m a late convert, but George is great. Thanks Mr. Ellis; I’ll be looking for that record in the bins. You know what else is amazing? how much Jim Carrey’s character in “Me, Myself, and Irene” looks like early Jones. 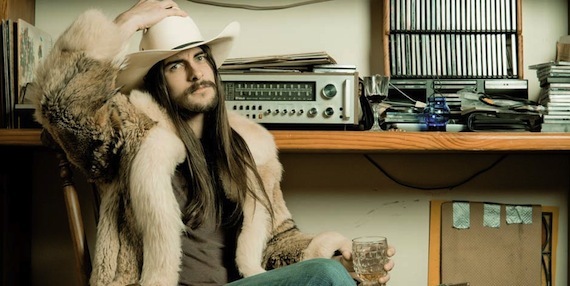 It’s awesome to see my favorite music site covering Robert Ellis. I’ve been watching him come up in Houston the last couple of years and he really is the real deal.